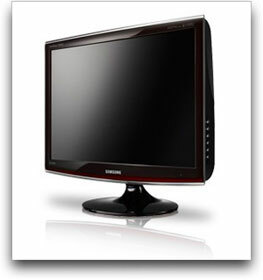 Samsung Touch Of Color T200HD 20-inch LCD HDTV Monitor ; the Samsung Touch Of Color T200HD LCD monitor is a great way to get the most out of your PC--as well as watch your favorite 1080p HDTV broadcasts. It features an embedded DTV tuner that enables you to watch digital HD broadcasts without a special receiving set. And with six image input terminals, you can connect several pieces of digital equipment to the T200HD and use them simultaneously. Two HDMI connections make your monitor a multimedia centerpiece. Additionally, SRS TruSurround XT is embedded to improve audio performance. With an amazing dynamic contrast ratio of 10,000:1 you’ll enjoy sharper image quality that’s sure to catch your eye. You'll also make a style statement with Samsung's new Touch of Color design, which features a hint of color naturally blended into the traditional piano black frame. The T200HD is designed to be extremely efficient and uses up to a third less power than other monitors in its class. The unique SoftPower off function lets you put the monitor in standby mode right away, using just 0.3 W of power. It comes with a monitor stand that can tilt up to 20 degrees for optimal viewing and a full-feature remote control. The monitor's speakers reside underneath the screen and provide a total of 6 watts of audio power (3 watts per channel).